It may be three years until the next presidential election, but it’s never too early to explore politics and the people who focus on making a difference through our political system. For those of us who aren’t active in the day-to-day aspects of politics, from lobbying to campaigning, it can be hard to understand how much dedication politics requires. To get an idea of what politics is like behind the scenes, we interviewed Rosa Clemente, the first Afro-Latina Green Party Vice Presidential Candidate. During this interview, Rosa discusses her identity as an Afro-Latina, her experience during the 2008 election campaign, and the importance of political engagement. Rosa Clemente is a community organizer, journalist, Hip Hop and political activist. Five years ago, as the Vice Presidential Candidate for the Green Party, she and Cynthia McKinney, Green Party Presidential Candidate, formed the first women of color ticket. The daughter of a mother from Ponce, and a father from Rio Pierdas, Rosa Clemente was born and raised in the Bronx. She earned her undergraduate degree at the University of Albany and her Masters of Professional Studies at Cornell University. She is currently in her second year of a doctoral program at the University of Massachusetts Amherst, and her dissertation focuses on the Black Latino, Hip Hop culture. When did you begin identifying as an Afro-Latino? My identity as a Black Puerto-Rican came about the age of 20, during my third year in college, when I was involved as a student leader, after I heard Marta Morena Vega speak. We were calling ourselves African, of African descent, or Black Latino in the 1990s. That term (Afro-Latino) is relatively new, over the past decade. Saying that (Afro-Latino) at the time was a relatively new phenomenon. People were still using Hispanic as the main term back then. Did you experience any resistance identifying as an Afro-Latino? Yes. Groups of Latinos called me a sell-out and some blacks said, “Well she’s Puerto Rican, she’s not black.” That was the moment when I knew I’d get backlash. I’m either not Latino enough or black enough. I don’t get invited to major Latino events. In this case, I think it has more to do with my politics (than my color). What role does politics play in the lives of people of African descent? We live in a world that is anti-black, anti-African, anti-indigenous…that is why we’re consistently attacked. You’re not being attacked because you’re Mexica or Puerto Rican, but because of a political agenda of white supremacy. As a group we’re under persistent attack on so many levels. We all have divergent political ideologies as a people…. (We) need to come together on a cultural level, but also on a political level. That’s what needs to happen. How can Afro-Latinos increase their political influence in U.S.A.? Understanding ongoing relationships and letting young people know the history. In urban communities there is so much misunderstanding. The whole idea of divide and conquer is very true and alive. We need to understand and always work together, but also understand the reality of our system. Descendants of African heritage are a diverse group. Are there issues that are of importance to those living in U.S.A.? Understand that white people are becoming a minority. It’s about the fact that African descendants will be the majority by 2035. Understand that white people are coming to us in fear and targeting specific groups. We need families not to be deported, but to be better educated. When this next election happens, Latinos will be pandered to, but it won’t be Afro-Latinos. It will be about pandering to the minority white professions, who are conservative. 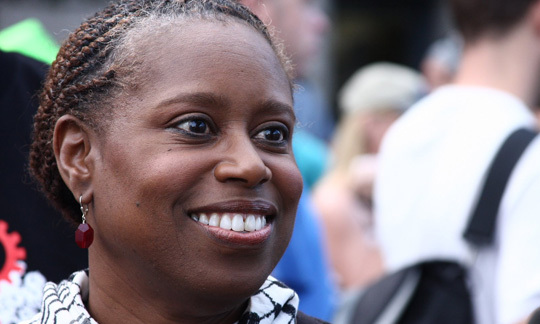 Was Cynthia McKinney the first African American Green Party Presidential Candidate? She’s the first African American on the Green Party ticket. I was the first Puerto Rican, but not the first Latina (Gloria Lariva was the first Latina). We made up the first women of color ticket. What was your relationship with Cynthia McKinney? She’s (Cynthia) powerful. I first met her in early 2000, when people understood Hip Hop was bigger than rap music. … (Hip Hop) can be used to mobilize, organize. She was a congresswoman who invited people to hearings using Hip Hop. When the war (Iraq) began, she was the one who asked Rumsfeld (Secretary of Defense during George W. Bush’s Administration) why he didn’t do anything about the 9/11 memo? That question was the start of her downfall. She is very clear on what is happening in this country and what this country is doing internationally. She completely changed my life, being mentored by her. I wish I would have documented more, but it was pretty amazing to be making and living history alongside a congresswoman. She taught me so much about the government (U.S.A). Our campaign was about the people and I’m very proud of that. Why did you choose to run for VP on the Green Party ticket, knowing the dominance of the two major political parties (Democrats and Republicans)? I had been a supporter [of the Green Party] for a long time, especially in college and I worked in internships and other positions. I knew by the time I was out of college that Democrats and Republicans were very similar. I always supported the Green Party, particularly in the last four years of George Bush. [Cynthia] McKinney was still a Democrat, when she lost her seat. Her documentary showed how the system voted her out. That’s when I decided to stay away from the two parties. I knew the Green Party’s platform and it was important for me to be a part of a Party for the decolonization of UN (United Nations) territories, and freeing political prisoners. While you were campaigning, did anything surprise you? What I saw when I traveled to the Southwest. I was excited to see what is yet to come out of the immigrant struggle. The movement is intergenerational. In 2008, what kind of support did the Green Party have in the African American and Latino Communities? We don’t really have any support in the electorate and that happens because we have a two party system, based on money and influenced of the media. It’s not about lack of support, but people not knowing. We have a lot people who vote, who don’t have voter education and that’s a huge problem in this country. The Green Party needs to realize that there are so many disenfranchised people that we could really build a big party, starting at the state level. What’s your thoughts about the media and politics? If there were a good media, the Green Party people would be on the air just as much as the Republicans or Democrats but they don’t give people the opportunity to hear or see our ideas. And obviously we’re running against Obama and there were Black and Latinos, a part of the system, saying we were crazy. What are your thoughts regarding the current state of affairs of people of African descent? I see our current state as a slow genocide. You shut down schools, and kids don’t have enough to eat. Prisons are set up to house them. Mostly blacks and Latinos, but also poor white kids are getting caught up in this system. We really have to talk about what’s happening. Unless we come together and deal with race as a factor because to me everything is political and everything that affects us comes from some policy that we have nothing to do with. On the ground, we have to organize. Occupy [Wall Street] was a great moment; the idea that we’re the 99 percent has given people discourse to talk about the economic gap in income equality. Any other comments? We now have to talk about the politics and what that means to us. The only thing that solves what we’re in is grass roots organizing, community building and a redistribution of wealth in this country. Do I foresee this happening? No. Will I fight for this until my last day? Yes.